With an egg-shaped pommel engraved on its faceted outer face with the name maria in gothic minuscule characters between panels of scrolls, horizontally recurved and gently arched quillons of flattened triangular section, widening very slightly to their ends and decorated on their outer face with a series of pinched medial ridges, long tang struck with a maker's mark formed of a pair of crossed axes within a circle, and a long tapering blade of flattened hexagonal section at the forte and of flattened diamond section for the remainder of its length, inlaid in latten on each side of the forte with a series of maker's marks involving crossed swords. This outstanding and beautifully preserved weapon, found in a tomb near Breslau, Silesia, in the late 1930s, is of a kind classified by Oakeshott, on the basis of the shape and proportions of its blade, as Type XVII: arguably the most elegant of all forms of Medieval sword. 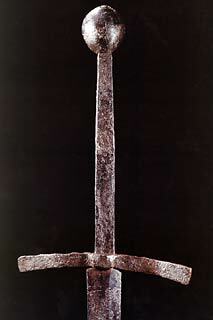 The earliest unequivocal evidence for the use of the type is provided by two examples in the Kantonales Antiquarium, Aarau, Switzerland, which were obtained from the graves of the Austrian knights Friedrich von Tarant and Friedrich von Griffenstein who fell in the Battle of Sempach in 1386. Evidence for its continuing use in the first half of the following century is provided by an example formerly in the Christensen Collection, Copenhagen, which bears an Arabic inscription recording its deposition as war-booty in the arsenal at Alexandria in 1427; see No. 4 in this catalogue. One of the latest and largest weapons of the type is the 'Pearl' sword of the City of Bristol, which bears an inscription recording its presentation to the city by Sir John de Wells during his term as Mayor of London in 1431. The present example rivals it not only in size, but also in quality. A particularly attractive feature of the sword under discussion is the engraved decoration of its pommel, including the name 'Maria', invoking the support of the Virgin Mary. The pommel is unusual among Medieval examples in being of egg-shaped form, but can be paralleled by one featured on a bronze statue of David in the Museo Bargello, Florence, sculpted by Donatello about 1430-32. It might indeed be viewed as a somewhat rounded version of the faceted 'scent-stopper' type of pommel used from about 1390-1445, and particularly popular in the period 1400-40. The quillons of the sword under discussion are notable for being forged on their outer face with a series of pinched ridges. Relief-decorated quillons were of the greatest rarity in the Middle Ages. The earliest recorded examples, formed as ragged staves, are those occurring on a sword in the Historisches Museum, Dresden, given to the Prince Elector Friedrich I of Saxony by the Emperor Sigismund I in 1425, and probably made in Hungary in the period 1419-25. 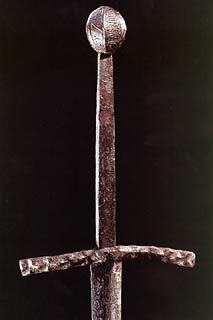 Very similar to the quillons of the present sword in both shape and cross-section are those of a sword in the Musee de Cluny, Paris, identified as that of the Emperor Friedrich III (1415-1440-1493). These are decorated on their outer face with transverse raised and recessed bands. Plain quillons of the same slightly spatulate, medially ridged form can be seen on eight swords in the Askeri Museum, Istanbul. These bear Arabic inscriptions indicating that they were deposited in the arsenal at Alexandria in the period 1401-08. Taking all of its features into consideration, the sword shown here is most likely to have been made in the earliest decades of the 15th century. Swords of Oakeshott's Type XVII are notable for their weight, and have been likened to 'stout, sharp-pointed bars'. They were quite clearly devised as a dual-purpose weapon that would be capable both of crushing and of piercing the gaps in the full plate armour that was then coming into widespread use. The present impressively proportioned weapon, approaching in size that of a two-handed sword, is not only an unusually attractive example of its kind, but must in its day have been an effective and extremely formidable one to meet in conflict. Literature: Oakeshott, E. The Sword in the Age of Chivalry, Woodbridge, Suffolk, 1994. I really like these antique sword profiles you put up. Thanks, Alina, I am glad to hear this! I know I enjoy reading these things.. was hoping somebody else would too. Posted: Thu 18 Nov, 2004 4:10 am Post subject: oh my! Interestingly enough, this posting made me look at the Sempach and Landgraf swords of Albion more closely. But I came to the same conclusion I always do - I'd rather have a Duke. Got any pics of big monster choppers in there Nathan? i am not supriced if it have a weight around 1.8kilo or 4 pound, if not more. Funny crossguard it have, nice looking frontside, like the owner want to hide the size of it. Very nice! I like the sleek, pointed, Gothic lines of that blade. But, I like my sword blades like I like my women-- nicely filled-out! Nevertheless, from an aesthetic standpoint, lines and proportions were definitely taken into heavy consideration by whomever crafted it. You would guess 4 pounds? Okay I'll argue. These things are very nearly an impact weapon rather then a sword. I've never liked the type and I'm pretty sure I remember reading in Oakeshott someplace that he didn't think much of them either. One should note that this is just my personal preference and that eventually I'll own one too (in fact I'm looking forward to seeing a Sempach in the very near future here). However, in my opinion these swords have more in common with crowbars then cutting weapons. I felt much the same as you until I was able to spend time with an accurate copy of the type (the Sempach). Like oakeshott I'd always felt that these swords were glorified ice picks with very little visual appeal. Now that I've spent time handling and cutting with one I find that I like it quite a bit. No, it won't take an aggressive cutting edge like some of the earlier, or later types but it isn't meant to. I do agree that in a sense it's meant to be an impact weapon as well. The cross section is very thick in comparison the earlier types. This was done as an attempt at increasing durability when used against the transitional armor of the day. It wouldn't cut through but it might stun your opponent, without breaking in the process. It won't take a really sharp edge since the bevels are so acute, but it will cut soft targets surprisingly well. (like all those unarmoured types running around a medieval battlefield). It still isn't one of my all-time faves but I do have an appreciation for the type that I didn't before. In reality it's a very interesting type that illustrates an important step in the knightly swords evolution. Are you sure that's a fuller? Close examination of the full length shots compared to the hilt close-ups leads me to believe that the blade features a hexagonal section without a fuller. This is very common in this type of sword, and one of the reasons Oakeshott felt they were boring visually. I agree with Patrick. It took me a few times of looking at it to really decide. Also, the description doesn't say there's a fuller so that clinched it for me. I believe it's just a shadow on the flat of the blade, as Patrick points out. Yea, looks like were seeing the spine as it narrows down the blade. Notice how it travels the entire length? Well, I can't say that I won't find myself in the same boat once I actually see this Sempach. The guy that is having it shipped here was certainly taken with the one he saw. BUT would you call it one of the most elegant types of medieval sword? This sword is screwing with my head, man! Elegance and beauty are in the eye of the beholder. Oakeshott ticks me off when he makes a statement that this type of sword is generally more beautiful than that. He makes such statements for the migration period weapons as well. What I find beautiful might be be considerably visually displeasing to someone else, and vise versa. I am not sure if we can make ANY arguments whether this this is more elegant than that. Oakeshott himself went on a rant (I think it was in "sword in hand") how type XVII vary and one will be light, well balanced weapon and another one will be a 4-5lb boat-anchor. Yet they were all period weapons that served their purpose rather successfully (i'd presume). Yes type XVII is different than the the other types, and they have their OWN elegance. According to some they might be THE MOST ELEGANT, and according to some they might be THE MOST REPULSIVE. I like them and appreciate them for what they are. Sempach is definitely on my list after the Duke comes in December.